Eliminate paper door hangers for your swimming pool maintenance customers. Our email notifications are sent after your technicians service your clients. 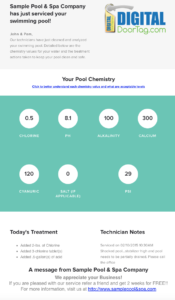 The emails include a complete water chemistry report, notes added by your service techs, and other valuable information about their swimming pool. Maintain your customer list in our simple cloud-based solution. We keep track of customer demographics and pool information so you can focus on running your business. Get your own dedicated phone number to give out to your customers to send photos and text messages. No more giving out personal cell phone or the cell phone of employees and having NO record of customer communications. Put your email address in the box below and we will email you a sample digital door tag. 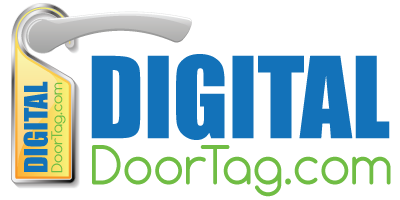 DigitalDoorTag.com saved us so much money by eliminating the need for printing paper door tags…and our customers LOVE IT! They know exactly what is going on with their swimming pool. Allow techs to upload photos of problem areas and document completed work.